Site conservation is among the most effective means to reduce global biodiversity loss. Therefore, it is critical to identify those sites where unique biodiversity must be conserved immediately. To this end, the concept of key biodiversity areas (KBA's) has been developed, seeking to identify and, ultimately, ensure that networks of globally important sites are safeguarded. This methodology builds up from the identification of species conservation targets (through the IUCN Red List) and nests within larger-scale conservation approaches. Sites selection is driven by the distribution and population of species that require site-level conservation. With this background, the Critical Ecosystem Partnership Fund initiated the study: Establishing a Baseline to Monitor Species and Key Biodiversity Areas in Belize which was to to contribute to the identification of globally significant sites for biodiversity in Belize by collecting data on various aspects of species conservation, in partnership with the grant, “Refining and Monitoring Conservation Outcomes in Northern and Southern Mesoamerica.” This information will support the development of site-based conservation strategies for Belize and the wider Mesoamerica Hotspot. Biodiversity baseline data such as those that can be used in the establishment of Key Biodiversity Areas (KBA’s) are scattered. In general, everywhere, but particularly in Belize, the access to biodiversity data is one of the principal constraints in effective conservation planning. In Belize a mechanism exists to gather such information. This system is called the Biodiversity and Environmental Resource Data System for Belize (BERDS). The idea behind BERDS is that members can and should enter their gathered biodiversity data and although the BERDS system has several members in and outside Belize, the actual data entry is lagging behind. The reason for this is very simple; most NGO’s and other members simple do not have the time and person-power allocated to data management. The project was initiated on October 1, 2006 with a dedicated KBA workshop on October 1 & 2, 2006 in Antigua, Guatemala. The physical implementation of the project took of on January 25, 2007 and was completed on 31 st of October 2007. The guiding principle for KBA species selection is the IUCN Red List. For this purpose data were gathered for all species in the CR (Critical), EN (Endangered), VU (Vulnerable) and NT (Near Threatened) classes with addition to the species mentioned in the “National List of Critical Species” Prepared under the National Protected Areas Policy and Systems Plan (Meerman, 2005). Not all species had sufficient data to allow effective analysis. After analysis of 31,560 data in BERDS only 77 species (39 of which are IUCN listed (CR, EN, VU, NT, CD)) had enough data to allow an estimate of actual distribution in the country. But ultimately only the 39 IUCN listed species counted for the KBA analysis. Selva Maya with Rio Bravo Conservation Area, Aguas Turbias National Park and Gallon Jug Private Management Area. Maya Mountains block including Vaca Plateau, Mountain Pine Ridge and Manatee River forest Reserve. A number of smaller, discrete areas including Sarstoon Temash National Park, Aguacaliente Wildlife Sanctuary, Golden Stream and Rio Grande Private Protected Areas, Peccary Hills (including Runaway Creek Nature Preserve) and Crooked Tree Wildlife Sanctuary. 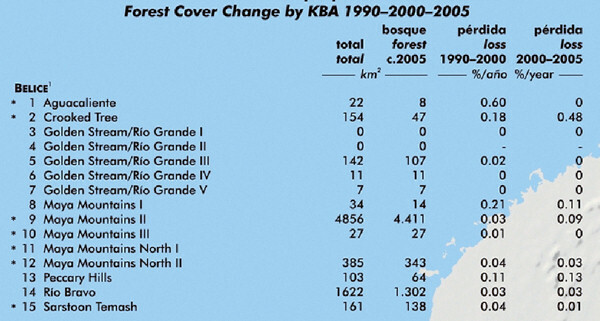 Also under the CEPF initiative: "Refining and Monitoring Conservation Outcomes in Mesoamerica", an analysis was made to establish the rate of deforestation in the identified KBA's in the period 1990-2005. 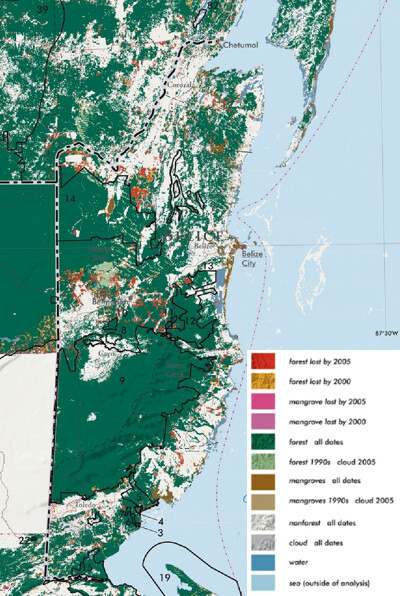 The results of this remote sensing analysis carried out for Belize by Jan Meerman have recently been published as poster with accompanying CD. Copies of which can be obtained from the APAMO office in Belize City. The image to the right is a copy of the Belize section of this map. In orange or red, deforested areas are indicated and in the table below, the deforestation figures for the individual KBA's are indicated. Clearly, the Belize KBA's are in good shape as far as deforestation is concerned! For this project forest is defined as closed canopy, mature, natural forest. Forest cover and change was mapped by analyzing Landsat satellite imagery from circa 1990, 2000 and 2005. Most of images were obtained from the University of Maryland's Global Land Cover Facility. 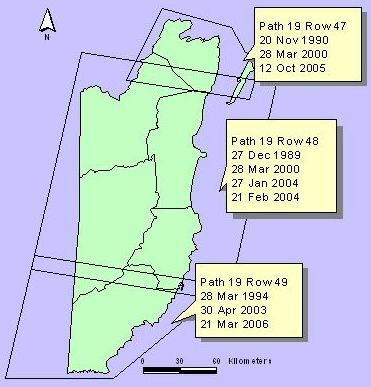 For Belize, the analysis was conducted at a spatial resolution of 28.5 m. The Landsat images were co-registred and the classification of forest cover and change conducted with the multi-temporal data. To produce the 3-date classification, a matrix was generated using the circa 1990-2000 and circa 2000-2005 classifications to highlight how the class values of the impact files overlapped and recording, by referencing the input images, performed to yield the final 3-date classification. The final classification was filtered to remove patches of less than 2 ha. 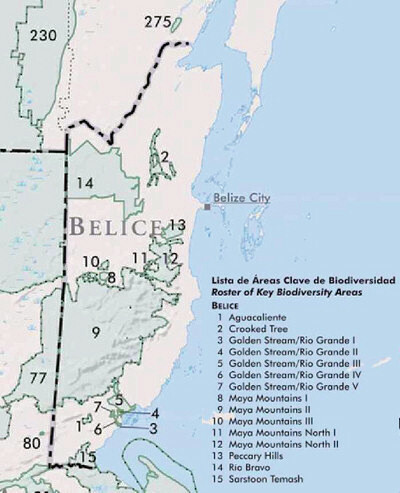 Accuracy of the final classification was estimated by a Google Earth Comparison analysis as well as comparing with an in-depth field-validated 2005 update of the Ecosystems Map of Belize. While the goal was to compare a 1990 baseline with 2000 and 2005 data, due to erratic availability of suitably cloud free images for these specific years, this was not always possible. An attempt was made to choose image date as close as possible to the target dates. The image to the left clarifies this. Jan Meerman, Belize Tropical Forest Studies, Belize.